The group 38 North pointed out on 06 June 2018 that demolition of the launch pad at a site near the northwest city of Kusong began during the second week of May and had been almost completed by 19 May 2018. 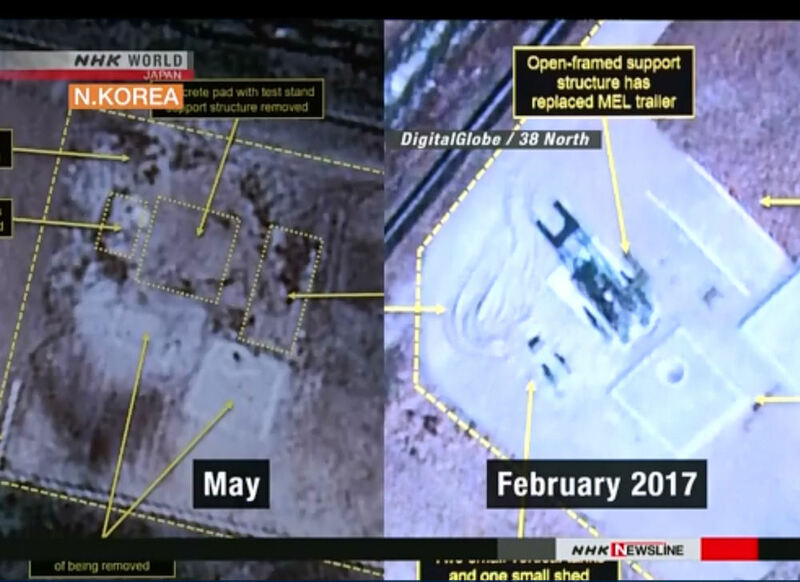 It said the site was used to launch the land-based Pukguksong-2 medium-range ballistic missile in February 2017. The Pukguksong-2 is a remodeled submarine-launched ballistic missile. 38 North adds that after the launch, construction of a new launch pad began at the site. The group said that by October 2017, work at the site had reached a completed state, covering an area of approximately 175 square meters with a launch canister in place. 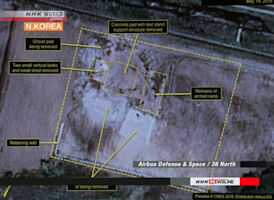 It said that the launch pad was used to develop the Pukguksong-2 and its successor medium-range missile. 38 North also says the facility could have been used for testing intercontinental ballistic missiles. 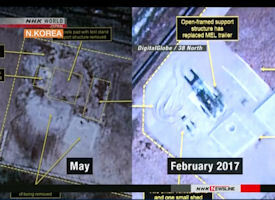 The group says that it was unclear if this shows Pyongyang is suspending this aspect of its missile program or intends to erect similar facilities in the future. It called for the need to continue monitoring the country. Kusong in North Pyongan Province is said to be a significant military industrial area, with many secret munitions plants standing roof-to-roof. North Korean uranium mines are also reportedly located in Kusong in North Pyongan province, Pyongsan in North Hwanghae province, and Sunchon in South Pyongan province. The small city of Kusong in the mountains north of Pyongyang, and the facility is located just 30 kilometers northwest of Yongbyon. 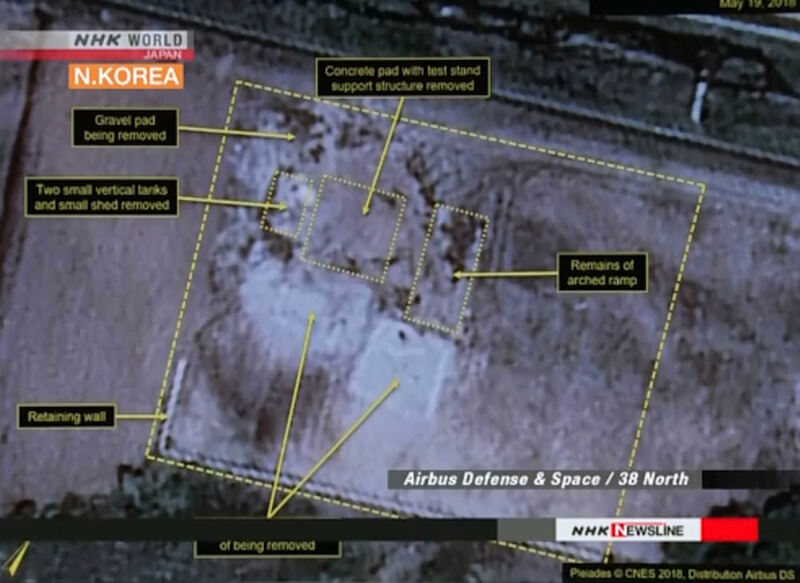 In late 1998 it was reported that satellite photos show that high explosive tests, a preparatory step to produce detonators for nuclear weapons, have been conducted in a valley in Kusong, some 30km northwest of Yongbyon. The Kusong complex was said to include a factory that produces detonators, warehouses and a test site. North Korea reportedly built a high explosives test site, which is essential to nuclear weapons development, in a valley between T'aech'on County and Kusong County in North P'yongan Province, and has conducted three to four high explosives tests. According to other reports in late 2002, the tests are said to be conducted deep inside two mine shafts to elude detection by satellites. The site is guarded by 2,500 soldiers, some of whom are deployed as spy-hunting teams in nearby mountains, and machine-gun emplacements overlook entrances to key facilities. South Korean newspapers have reported that in late 1997, a North Korean soldier provided samples of topsoil from the area to a South Korean intelligence agent. The soil samples reportedly contained radioactive particles typical of residue from a full-scale high-explosive test using fissile material. Some of the parts needed for the tests are reportedly manufactured at factories located just south of the test sites.